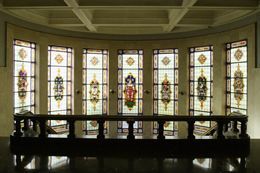 The Universidad de La Laguna (ULL) is the oldest institution of higher education learning in the Canary Islands, and it is possible to trace its history back more than 200 years. Its founding decree, signed by King Charles IV of Spain, is dated the 11th March 1792. Since that date, it has undergone changes and been known by different names until finally being given its current name in 1913. Two hundred years after it was founded, the Universidad de La Laguna continues to be a beacon for society in the Canary Islands that, using the Atlantic as a bridge, has stretched out its hand to the rest of the world. Currently, this public institution is home to more than 25,000 individuals who are either students, academic or research staff, or administrative staff and service personnel. The university’s course catalogue includes: 45 undergraduate degrees; 21 official graduate courses in the process of being phased out and 30 official master’s degrees; 52 doctoral programs; and 25 master’s degrees unique to this university. In addition, 17,813 students are currently enrolled in degrees, and 2918 in courses in the process of being phased out. The ULL is now undergoing internal restructuring to revamp its offerings. It has placed particular emphasis on the use of new information and communication technologies and telematics programs throughout the institution. All the activities being run under this initiative have been centralized under the control of the Virtual Teaching Unit (Unidad de Docencia Virtual). The geographical position of Canary Islands in the Atlantic region places them between three continents, which means that, from a strategic point of view, the universities located on the islands are well placed to become important hubs of reference and flagships of knowledge and learning in the Atlantic. 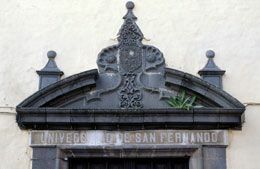 The very beginnings of university life in the Canary Islands began back in 1701 when the Augustinian Order founded a centre for higher education in the city San Cristóbal de La Laguna. In 1744, a papal bull was issued proposing that the centre be transformed into the Ecclesiastical University of St. Augustine. This gave rise to a number of legal measures, and numerous legal set backs, which prevented it from ever being established. On 11th March 1792, by royal decree, Charles IV of Spain ordered the creation of the first Literary University of the Canary Islands in the then capital of Tenerife. However, the tense political climate of the time blocked it from being established. Once the Bourbon dynasty was restored, Fernando VII of Spain once again took up the baton for the Canary Islands’ people. In his efforts to select a physical location to establish the university, he was careful to try to quell any inter-island rivalry. In 1816, he issued a new royal decree stating that “ in the city of San Cristóbal de La Laguna a new university shall be established with the same honours, exemptions and privileges as those enjoyed by other universities in the kingdom, and shall be given the name of the St. Ferdinand University [Universidad de San Fernando] ”. To these ends, the Jesuit College House in San Cristóbal de La Laguna was converted into the main campus of the St. Ferdinand Literary University. The university officially opened its doors as an academic institution on 12th January 1817. Soon however, the building itself proved too small to house the increasing numbers of students. As such, steps were taken to partially relocate the university in the St. Augustine College. Students and members of the religious order initially cohabited, but finally, in 1837, the religious order was forced to vacate the site under the Mendizábal Ecclesiastical Confiscations Act and the building was fully converted to house the university’s activities. The Jesuit College House, as a result, became home to the university senate, the main conference hall, the library, along with Latin Studies, and the first school of arts under the authority of the town hall of La Laguna. The Patriotic Society and the Royal Economic Society of Friends of the Country also had a meeting room in the building. However, the university suffered from numerous deficiencies, predominantly a lack of resources and complications involving teaching staff. These deficiencies led to repeated calls for its closure and in 1845 it was officially abolished by royal order, thereby reducing the number of Spanish universities to ten whilst laying the foundations for the creation of the Canary Island Institute in San Cristóbal de La Laguna. Bibliography: NÚÑEZ MUÑOZ, María F. (editors): Historia de la Universidad de La Laguna, SPULL (Institutional Publications), tomes I and II. Tenerife, 1998. In 1906, King Alfonso XIII of Spain visited the Canary Island Institute. Its then director, Adolfo Cabrera Pinto, used the occasion to ask the Spanish monarch to re-establish the St. Ferdinand University. This request did not fall on deaf ears and first bore fruit in 1913 when a royal decree ordered the creation of university studies correlating to the first year of the Faculty of Philosophy and Arts and also a foundation course for Law. These would be taught on the premises of the Institute, which would be directed by the centre’s director, Adolfo Cabrera Pinto. This section of the university was expanded in 1917 with a foundation course for entry into the Faculty of Medicine and the Faculty of Pharmacy. In 1921, its Law program was completed and with that San Cristóbal de La Laguna could once again call itself a university city. However the actual University of La Laguna wasn’t created until a royal decree was issued on September 21st, 1927 making it the XII Spanish university district. The Rector was the then dean-governor of the university, Jose Escobedo and also González-Alberú. The aforementioned royal decree firmly established the Faculty of Law, the Faculty of Chemical Sciences and the foundation course for the Faculty of Philosophy and Arts, the program of which was completed later. The gradual growth in the size of these faculties led to a need to construct a new building for the university. In 1929 a public tender was published for the design of a new university building and residence hall on a plot of land belonging to the municipal authorities on a site known as «El Cercado del Marqués». After all submitted entries had been studied, the tender was finally awarded to the architect Ceballos 1935. Unfortunately, the construction project suffered serious delays, amongst other reasons, as a result of the Spanish Civil War and the new political regime that had been established. In 1942, Classic Language Studies were incorporated into the university’s offerings, which led to the creation of the Faculty of Philosophy and Arts. Five years later this program was replaced by Romance Language Studies. Finally, in 1960 the new university building was inaugurated in its entirety. This building is now the site of the central campus, although at the time of its inauguration it held the Law Faculty, the Sciences Faculty, the Central Library, the Rectorate and the University Secretariat. These new facilities saw the expansion of the Universidad de La Laguna. The departments of English Philology (1963), Biology (1967) and Mathematics (1969) were established along with the Faculty of Medicine (1968). The consequent growth of the institution included the incorporation of new studies, the division of the different disciplines and various other developments. These developments led to the creation of new centres that have helped put the Universidad de La Laguna on par with the best universities in Spain. In 1972, the schools of Business Studies and Teacher Training were established, and one year later the Technical Architecture College was created. The Faculty of Pharmacy was created in 1974 followed by the Faculty of Economics and Business Administration in 1975. The College of Nursing was established in 1977, one year prior to the division of the Faculty of Sciences and in which the faculties of Biology and Mathematics were established. In 1978 the College of Social Work was also created and in 1979 the Faculty of Fine Arts. In 1982, the old Faculty of Philosophy and Arts was divided into the faculties of Philology, Philosophy, Psychology and Educational Sciences, Geography, and History. In 1987 the old College of Nursing was renamed as the College of Nursing and Physiotherapy, then in 1988 the Faculty of Information Sciences was established, followed by the faculties of Psychology and Physics in 1989. 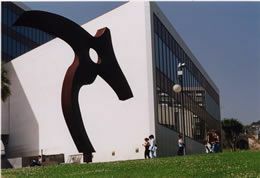 In the 1990s new centres were established that were more in line with the new Spanish university system, which included Nautical and Ocean Studies and Computer Sciences (1990), Agricultural Sciences (1991) and Education (1995). Finally, in 1999 the Centre for Social and Political Sciences was established. 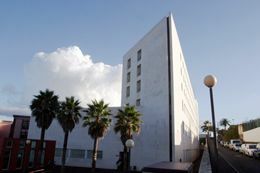 The ever-growing demand for higher education in the Canaries also led the Universidad de La Laguna to create the College of Las Palmas, which offers studies in Medicine (1973), as well as undergraduate degrees in Law, Philology and Geography and History (1982). This school was governed by the Universidad de La Laguna until 1989, the date on which the Universidad de Las Palmas de Gran Canaria was founded. 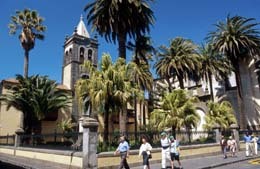 The central campus of the Universidad de La Laguna is located in the city after which it takes its name, San Cristóbal de La Laguna, which is located on the island of Tenerife. It is from here that the university carries out all of the activities assigned to it by law across the archipelago. According to its statutes, the Universidad de La Laguna is a public institution that is a legal entity with its own capital resources, acting independently in accordance with the Spanish Constitution and Spanish law whose purpose is to provide higher education as a public service. Its activity is founded on the principle of academic freedom; this freedom allows professors to teach what they see fit, and researchers to carry out the studies and research that they wish to pursue – so long as it falls within the law – whilst at the same time guaranteeing freedom of speech, the right to spread knowledge, and artistic, humanistic, scientific and technical production and creativity. Pursuant to the organic law regulating universities the Universidad de La Laguna is democratically organised so as to ensure that its governance, and that of the different centres, includes the participation of the different sectors that form the academic community. Today the Universidad de La Laguna has 23,000 students, 1,695 professors and 851 administrative and service employees. In the two hundred years since it was founded, the Universidad de La Laguna has served an important educational, scientific and cultural beacon in the Canary Islands. It has pushed forward progress in our community and contributed greatly towards the modernization of our society. 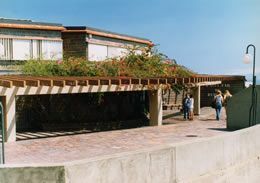 Continuing this tradition, the Universidad de La Laguna’s main mission is to contribute towards the general wellbeing of citizens of the Canary Islands by guaranteeing them quality in higher education, by fostering economic development through scientific and technical research, and by propagating culture, scientific knowledge and the arts across the entire Archipelago through its main activities and university extension programs. To deliver on its promises, the Universidad de La Laguna has laid down some basic principles to guide the activities of all its members. In their efforts, members should strive to: continuously update their skills, demonstrate professional and scientific rigour, be honest and take full responsibility for their own work, and defend tolerance and the critical spirit. It therefore commits itself to transmitting these ideals and the important task of delivering a well-rounded education to its students to instil in them an entrepreneurial spirit, critical thinking skills, and a sense of solidarity in order to make them committed to improving the future of their community and the world at large. The Universidad de La Laguna wants to ensure that as an institution that generates public goods for the social environment, both society and institutions can appreciate the quality and value of its services. It wants people to be able to view these outputs as tangible services whose efficiency can be measured against those of other institutions or universities. As such, the University has sworn to be permanently accountable for the effective management of its accounts and the quality of its services. Over the next decade, the Universidad de La Laguna aims to seize the advantages for intercultural dialogue offered by the geographical location of the Canary Islands and has set forth a strategic goal of turning itself into the European Atlantic University. Under this strategy it would become a site for distance teaching and research, making it the preferred destination for students and researchers in the Canary Islands as well as the rest of the Atlantic region. At the same time, the University is working towards making a large proportion of its members part of the most prestigious networks for scientific and educational exchanges. We want the hallmark of the Universidad de La Laguna to be the quality of its teaching and to be able to publically demonstrate continuous steps are always being taken to improve educational excellence. We want the Universidad de La Laguna to be recognised as a centre of excellence in research based on the work of its groups of excellent researches. We want the Universidad de La Laguna to play an importance role in: designing a sustainable social, cultural and economic model for the Canary Islands; transmitting its educational and cultural action plans to all citizens across the Canary Islands; and participating in the creation of new initiatives governing technological development and innovation, such as adequate means through which to create sustainable development in the Archipelago, social cohesion, and shared civic values amongst the population. We want the Universidad de La Laguna to be a modern organization that is concerned about the quality of the services it offers to society. We want its members to feel strongly identified with the improvement targets. We want a stable organizational structure that is capable of reacting quickly and efficiently to management needs.